Laura is a Licensed Professional Counselor who believes in creating a warm, empathic, non-judgemental therapeutic space for clients to help them move through their struggles and toward a happier, more meaningful life. She is an integrative therapist who incorporates Person-Centered, Psychodynamic and Dialectical Behavior Therapy theories. She also has a passion for holistic mind-body perspectives, such as mindfulness, to assist clients in their positive growth and development of coping strategies. Laura helps clients who are struggling with a variety of concerns, including but not limited to clients who have experienced trauma and related concerns, chronic illness, anxiety, depression, significant life transitions, loss and grief. 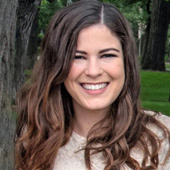 Laura received her Bachelors of Arts in Psychology from University of Illinois at Chicago and obtained her Masters of Arts in Counseling from Northwestern University in Evanston, IL. While obtaining her Masters, Laura trained at The Family Institute and Kenneth Young Center, a community mental health facility where she saw individual clients and facilitated a Dialectical Behavior Therapy group that focused on building emotion regulation, mindfulness, distress tolerance and interpersonal relationship skills. Through her experience working with clients, Laura believes that people have internal strength and knowledge that may be accessed if given tools and support to realize their own potential and power. She enjoys walking alongside her clients as they overcome pain and obstacles in order to live a happier, healthier and more meaningful life. She works with young adult, middle-age and older-adult clients with many different concerns and diagnoses. Laura’s experiences working in cross cultural settings gives her an appreciation for diverse perspectives and experiences.